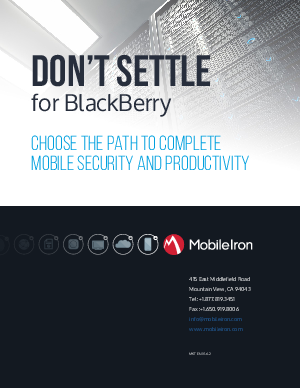 Now is the time to switch from BlackBerry’s new and unproven mobile device management (MDM) offering to a modern, comprehensive EMM solution like MobileIron. In today’s highly competitive and fast-paced global economy, the last thing companies need is an MDM vendor who is always playing catch up through technology acquisitions that cost too much and offer too little. MobileIron is a recognized industry leader that has always been 100% focused on mobile security. Our unified, multi-OS EMM platform was built from the ground up to meet the needs of the modern mobile enterprise by reducing IT complexity, delivering a secure user experience, and protecting mobile apps and data on any device, in any cloud service, anywhere in the world.